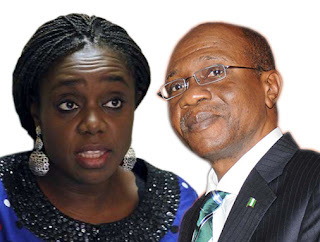 The Senate on Wednesday, summoned the Minister of Finance, Mrs. Kemi Adeosun, and the Governor, Central Bank of Nigeria, Mr. Godwin Emefiele, to appear before it and brief the senators on the current state of the economy. This was sequel to a motion by the Chairman, Senate Committee on Gas, Senator Bassey Akpan. The upper legislative chamber had debated the current status of the Nigerian economy on a motion on Wednesday. On Tuesday, Bassey Akpan, a senator from Akwa Ibom north-east, raised a point of order under order 42 of the senate rules- which has to do with matters of urgent national importance. Akpan while making his submission stated that the economy had slipped into a full-blown‎ recession, and added that it needed an urgent remedy. “I wish to draw the attention of this chamber to the statistics of Nigeria Bureau of Statistics (NBS) on the state of Nigerian economy. Statistics have shown that our economy has gone into a full-blown recession,” he had said. After listening to him, Senate President Bukola Saraki ‎ stood down the matter to Wednesday- when the motion on the economy was‎ debated. According to the NBS, 1.5 million Nigerians became unemployed in 2016.This is besides 13.7 percent inflation rate, and the depreciating value of the naira. At its MPC meeting on Tuesday, the apex bank resolved to adopt a flexible foreign exchange policy just as it said that a recession was imminent.